You wake up at 3am with your heart racing. You have a pit in your stomach. You feel restless, light-headed, and hot. Your mind starts to race, and before you know it, you’re worrying about the list of things that need to be done tomorrow. Though mind and body reactions may vary, these symptoms are often an indication of anxiety. According to the Mayo Clinic, occasional anxiety is normal, but those with anxiety disorders experience powerful, excessive, and constant worry and fear about normal circumstances. Anxiety disorders can involve episodes of intense fear, resulting in a panic attack, and these feelings can often interfere with everyday life. While anxiety can require medication and professional intervention, there are natural ways that may help calm you when those jittery feelings come on. Check out our natural antianxiety remedies below. This popular herb is a go-to for calming. In fact, one study found that those with generalized anxiety disorder who took chamomile supplements had a significant decrease in symptoms of anxiety. Brew yourself a cup of tea at night or opt for a chamomile supplement. Have you ever experienced a “runner’s high,” the sense of mental clarity and calmness you feel after vigorous exercise? Aside from its physical health benefits, exercise can act as an immediate and long-term antidote to depression and anxiety. Physical exercise also produces endorphins, which are chemicals in the brain that act as natural painkillers. For an extra boost of relaxation, head to the sauna after your workout – the warming sensation can impact the neural circuits that control your mood, including those that affect serotonin. When you’re anxious, it can feel like your brain is constantly racing. A great way to calm anxiety and quiet your mind is through meditation. Meditation focuses on replacing chaotic, anxious thoughts with a sense of calm and mindfulness. If you’re new to meditation, try a guided meditation app, such as Headspace, Calm, or Aura. 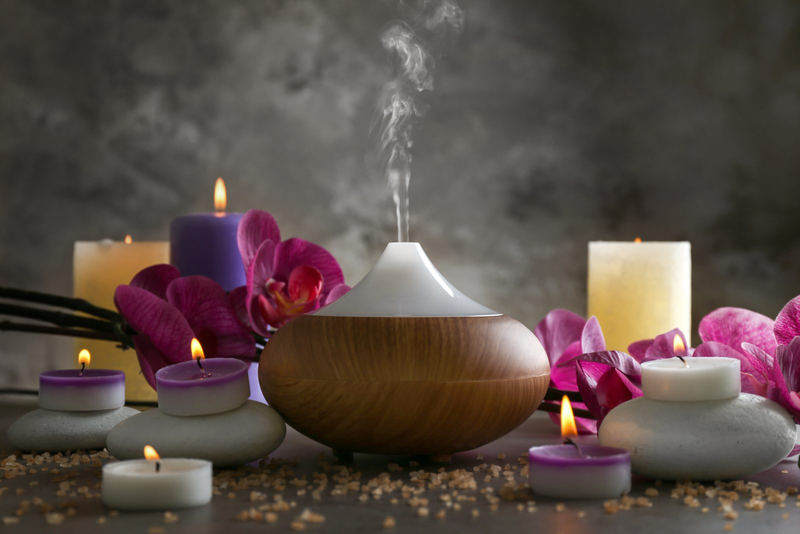 Aromatherapy is the practice of inhaling the scent of essential oils to improve overall well-being; it’s a great option for anxiety relief and relaxation. Those who use essential oils find they help with sleep and mood as well as reducing heart rate and blood pressure. While each essential oil has its own use and effect, bergamot, lavender, clary sage, grapefruit, and ylang-ylang are great options to calm anxiety. It can be tempting to reach for comfort foods when you’re anxious, but there are actually ways to nourish your body that will reduce uneasy feelings. Low blood sugar, dehydration, and the chemicals in processed foods can alter mood in some people, so it’s important to take note of how you feel after eating them. It can be helpful to hydrate, cut back on processed foods, and eat a healthy diet of complex carbohydrates, fruits, vegetables, and lean proteins. Try incorporating sources of omega-3s, like salmon, canned tuna, or walnuts, into your diet. Evidence suggests that omega-3 fatty acids can lessen symptoms of anxiety and increase mood by decreasing levels of adrenaline and cortisol. If you feel a pang of anxiety in the middle of the workday, take a 15-minute break for some sunshine! Aside from removing yourself from what may be a stress-inducing environment, increased vitamin D levels can decrease symptoms of anxiety and depression. And while you’re at it, bump up those endorphins by taking a brisk walk around the block. While natural remedies may ease symptoms of anxiety, if feelings and symptoms of anxiety are getting in the way of your work, relationships, or everyday life, it’s important to seek a professional opinion. Read the full article of our Beauty Influencer Shirley Madhere by clicking here.